Innovatronix say they have Li-ion Tronix Explorer battery packs "in the pipeline" for next year, following the demonstration of prototypes at the Photokina trade fair last week. 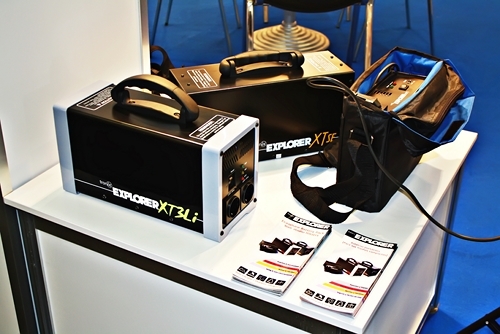 Filipino manufacturer Innovatronix have revealed that lithium ion versions of their Tronix Explorer battery packs are “in the pipeline” for next year, following the demonstration of prototypes at the Photokina trade fair last week in Cologne. The firm is one of the market leaders in battery-powered pure sine wave inverters, which are used by photographers to run mains-powered studio flashes outdoors and on location. According to the company, there will “most likely” be two different models, the Explorer XT3Li and Explorer MiniLi, with similar form to the existing sealed lead-acid units, but adding the “obvious advantage of a much lighter battery pack”. Exact specifications and features have not yet been finalised and Innovatronix are giving no clues as to the anticipated price point. Company representative Glen Dedicatoria said, “We wanted our battery packs to be suited according to the needs of the photographer, including his on-location lighting set up, improvements on design and functionality and at how much will these battery packs will cost.